Act 1014 of 2005 requires that UCA offer “most” undergraduate programs on an Eight-Semester Guaranteed program of study. Unless your program has been explicitly excluded, it must have an eight-semester completion plan. Authorization to exclude a program requires the approval of the college dean and the Office of the Provost. The following instructions are intended as a guide to the creation of an Eight-Semester Academic Map (AMAP). If departments are developing new plans or revising existing ones in significant ways, they should consult with staff in the Academic Advising Center for assistance. In the list of programs in the Undergraduate Academic Program Guide web site, these identifiers are used in the AMAP links: AMAP-8S, AMAP-OTHER, and AMAP-AA2Y. Be sure to complete all relevant header information. Note that you will need to enter in the header the total number of hours required for graduation (usually 120 for baccalaureate programs, of course, and never less). Your program completion plan should be as specific in the listing of courses as you are able to guarantee. Where possible, list specific courses students should enroll in to complete your program, including major and UCA Core requirements (see below for more on the UCA Core). Please list specific courses by subject prefix, course number, and title; or by using an appropriate and consistent notation such as “Business Core requirement,” “Major elective,” or “Minor elective.” Credit hours should be listed in the appropriate column as a single digit number or, if courses might vary in credit hours, as a range (e.g., 4-5, where the suggested courses might be for 4 or 5 credit hours). See appropriate choices, alternatives, or substitutions under “UCA Core” in the Undergraduate Bulletin. During the first year, a student must complete a UCA Core course designated as a First-Year Seminar (FYS) in Critical Inquiry, Diversity, or Responsible Living. An approved UCA Core lab science and an approved UCA Core math course should be taken in the first two years if possible. The student will also need to complete major, minor, or general elective courses designated as fulfilling the upper-division and capstone requirements of the UCA Core. If you wish to list an area requirement, but not a specific course, please do so as “UCA Core (area),” using the parenthetical area information to identify the appropriate description defined in the UCA Core check sheet. Finally, every AMAP should also include enough “General electives” to reach the total number of credit hours necessary for graduation. Programs requiring a minor will need to balance general and minor elective hours (see below). This Academic Map includes [##] credit hours in the Minor field of study. Minor requirements range from 15 to 27 credit hours. Depending on the minor selected, the student will need to adjust the number of general elective and minor elective credit hours in this AMAP. Students with no previous experience with a foreign language may need to enroll in up to six hours of lower-level instruction to prepare for this requirement. These courses are not included in this plan of study. Please note that such need voids a guaranteed Eight-Semester plan of study. The Academic Advising Center and the Department of World Languages, Literatures, and Cultures recommend that students complete the foreign language requirement as early as possible in their program in order not to lose fluency gained in high school. Depending on the math or science courses selected to satisfy the special degree requirements for a Bachelor of Science, the student will need to adjust the number of general elective hours in this AMAP. For further details about the BS Science/Math requirement, see the Undergraduate Bulletin, “Degree Requirements,” § 2.2.5, Bachelor of Science. If your program includes courses that are only offered every other year, provide an alternative course suggestion in that slot, using an “or” between suggested courses. Be sure that you also include these courses the following year, as well, again with an alternative course suggestion. Select the References tab/ribbon. In the Footnotes section of the ribbon, select the option arrow (see Figure 1). 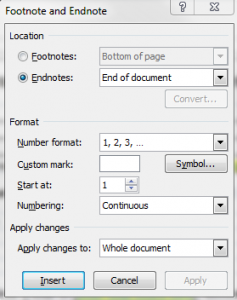 Place your cursor where you want the note number to appear, select Insert Endnote, and type your note. Once you have finished typing your note, move your cursor back to the body of your document and resume typing. Endnotes rather than footnotes are appropriate here in order not to interrupt the body of the AMAP and the signature block. NOTE: If you need to refer to the same endnote more than once, use Word’s Cross-Reference function. This will allow all the references to any given note to be updated when the original endnote is renumbered, moved, etc. See the Help system in Word for assistance in using cross-references. Every Eight-Semester AMAP must be accompanied by a signed hard copy of the plan. Once the AMAP is finalized and ready for publication, you will be sent a PDF copy of the document. You will print the AMAP for signature by the department chair and the college dean and send this hard-copy document with original signatures to the Office of the Provost. This step is necessary because UCA is required by law to provide a signed copy of this plan to all students who accept an Eight-Semester guaranteed contract.